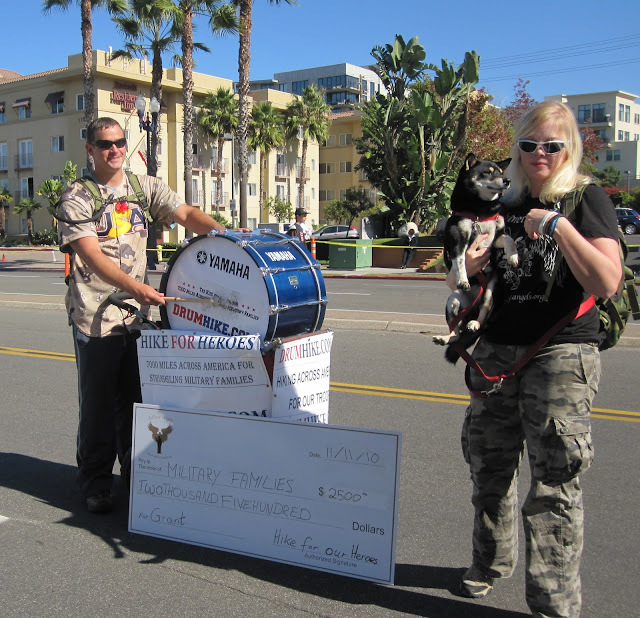 I'm excited to report that I got to meet Emmie and Troy today at the San Diego Veteran's Day parade. For those who aren't familiar, Troy Yocum is an Iraq War Veteran and has been on a 7,000 mile hike back and forth across the country to raise $5 million to help military families in need http://www.drumhike.com/ The hike kicked off in April 2010 in Louisville, KY and will ultimately circle back to Louisville in August 2011. 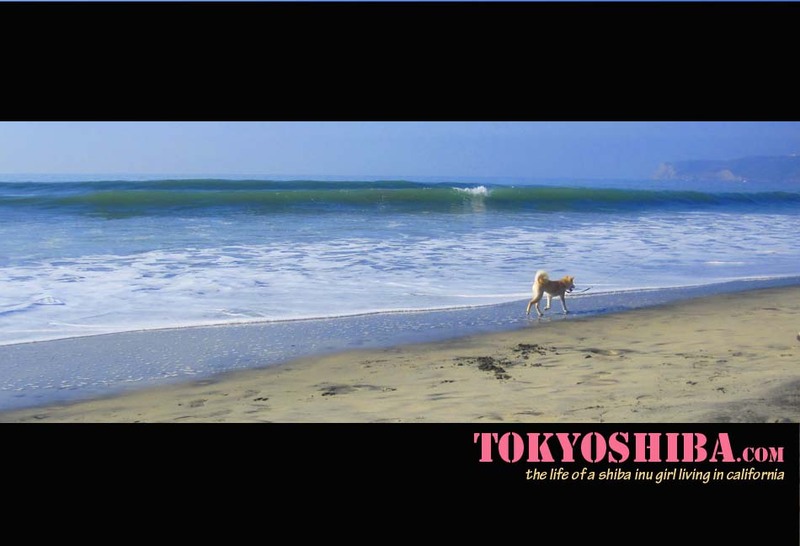 Now, no story would be complete without a special little shiba. Troy is not only hiking across the country with his wife Mareike and Chihuahua Harley but also with his faithful companion Emmie the SuperDog. On Thursday, November 11 they finally reached my hometown and I got to meet Emmie and Troy before they marched in the Veteran's Day parade. I gave Emmie lots of Shiba kisses while my Mom chatted with Mareike. 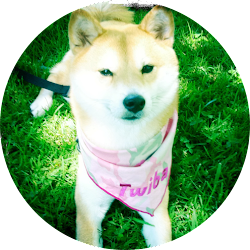 The San Diego Shiba Meetup Group prepared a special gift package for them, complete with yummy dog treats and a green stuffed hippo for Emmie. 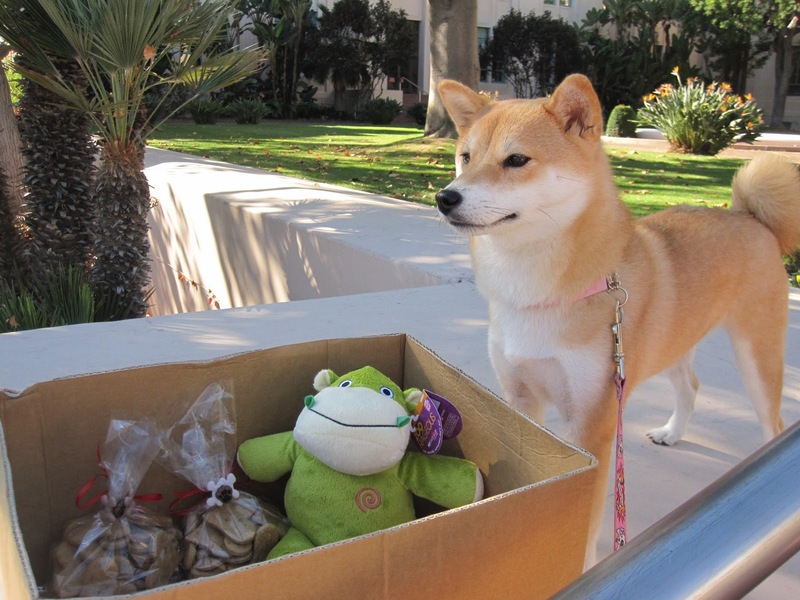 I was on shiba-duty and volunteered to guard the goodie box until we were able to hand it over to Troy's crew. Great job representing Tokyo! Thank you for sharing!